Where to go, what to order and how to relish the midday meal. Grossman's father, Feld Enertainment CEO Kenneth Feld, prepares to pass the baton. Got a kid (or grandkid) itching to perform, paint or just discover the artist within? Sign ’em up for one or more of these opportunities. 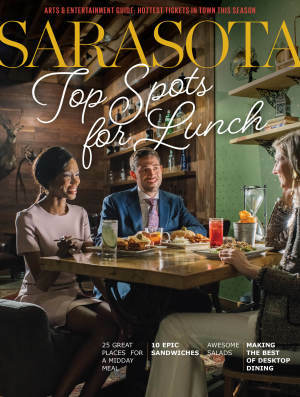 Sarasotans love to turn out for a good talk—especially if it features an expert or a celeb. Here are a few highlights of the upcoming lecture season. The 29-year-old identical twins will perform at the Van Wezel from Nov. 30-Dec. 3. “This role is so much fun, because he’s such an accomplished showman." Shukla’s bronze makes 14 Ringling computer animation students who have won a Student Academy Award. Our arts editor scoops up the don’t-miss tickets for the coming cultural season, from theater and music to comedy, dance and more. Who Exactly is Disgraced Political Candidate Melissa Howard? In addition to leading the development of closed captioning technology, Crane is a multi-Emmy Award-winning technical manager for NBC's Olympics coverage—and owns a landscaping business with his son. New fish parents will receive updates on the snook that their donation supports.